The Payment Card Industry(PCI) Data Security Standard is a proprietary information security standard for organizations that handle branded credit cards from the major card issuers including Visa, Master Card, American Express and Discover. 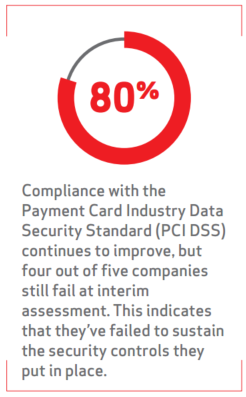 The PCI Standard is mandated by the card brands and administered by the Payment Card Industry Security Standards Council. It was created to increase controls around cardholder data to reduce credit card fraud and is used throughout the country by all of the organizations which store, process and transmit cardholder data. Arcadia processes over $6 million per year in Visa and Master Card transactions. Our Certification of PCI compliance is performed annually by an independent external auditing firm who conducts an on-site review. Compliance is also maintained by having an independent outside scanning vendor perform a yearly network scan. To insure enhanced security the PCI Data Security Standard specifies twelve requirements for compliance, organized into six related groups called control objectives. One important control objective is to prevent loss of cardholder data by encryption of cardholder data when it is transmitted across open, public networks. Another is to maintain a secure network by the installation of a firewall configuration to protect cardholder data. In addition Arcadia regularly monitors and tests the network by tracking all access to network resources and cardholder data and by regularly testing security systems and processes. Arcadia’s employee work stations maintain the highest security standards: no outside software can be installed and nothing can be downloaded from the Internet. Strong access control measures include strict password policies and a Log In monitor for all employees. And to insure that everything is always up-to-date in the system, Arcadia maintains its own unique Patch Management program. Arcadia is proud that we have achieved the highest standard possible for keeping customer payment card information safe. We are always up-to-date with the latest technology and all security protocols so the entire infrastructure is sound and secure. As a result we are a very attractive option for current and potential customers. In summary, being Level 1 PCI compliant is a very significant designation for Arcadia Recovery Bureau. It means that Arcadia is held to the very highest standards in keeping our customer’s payment card information safe. To insure that this happens Arcadia utilizes the most up to date procedures and technology in the industry. 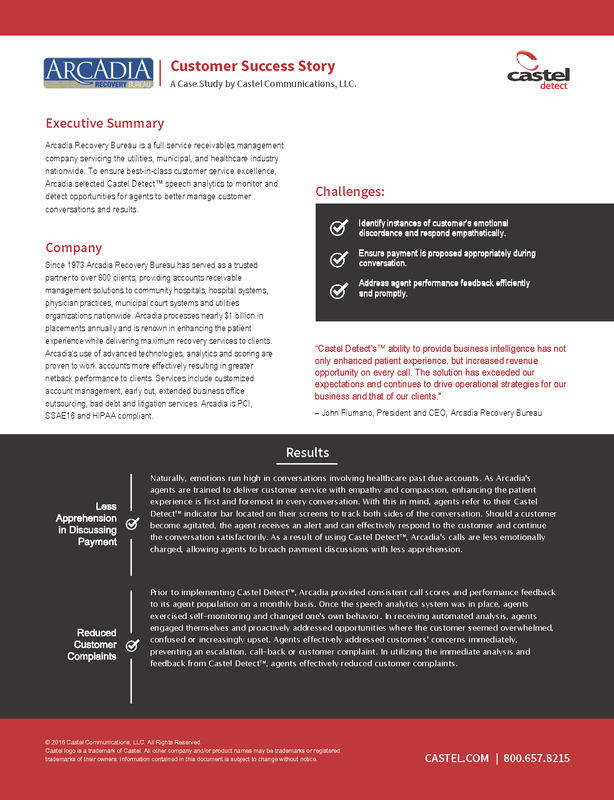 This enables Arcadia to provide best in class performance and service for all of our customers all of the time fulfilling Arcadia’s commitment of “Pride in Excellence”. Arcadia is known industry-wide for its first-party and third-party collection expertise provided to public and privately held utility companies across the country. Long term tenured utility specialists are led by the department manager Franklyn who has well over 10 years of industry and utility experience. Arcadia Recovery Bureau’s objective is to provide additional understanding and direction relating to the consumer’s utility bill. This allows our specialists to assist consumers in a compassionate and helpful way to resolve their outstanding debt. Key differentiators that separate us from the competition is our extensive tenured management team, training programs, and consistency in providing outstanding service while always exceeding client’s expectations. Some of Arcadia’s key differentiators are listed below. Extensive background and pre-employment testing is given to ensure the very best talent for our clients. Team of dedicated and loyal employees continually focus on delivering best in class service and performance for all of our customers. Ethics and integrity in everything we do. Her work ethic provides Arcadia Recovery Bureau with many opportunities throughout the healthcare industry. Since heather joined the team she has expanded Arcadia’s footprint and presence in the state of New Jersey and the Northeast healthcare market. Her work ethic and tireless commitment to excellence has positioned Arcadia to be a leading provider of healthcare products and services in the Northeast region. Heather’s passion and commitment to providing best in class healthcare products and service to healthcare providers and prospects is what sets Arcadia Recovery Bureau apart from its competition. Each year the NJ Chapter of the Healthcare Financial Management Association recognizes an individual who served in a non-leadership position* that has gone above and beyond the call of duty, leading the change in our chapter and industry. This individual contributed to either a significant program or event for the chapter during the chapter year. Heather Stanisci was the event chair for the extremely successful Women’s Event held in April 2015. She led a team of individuals who planned and executed the event from start to finish. The April 2015 session exceeded all prior year’s Women’s Events in both the number of attendees as well as the evaluation rating from the attendees who participated. The role Heather played took a great deal of volunteer time and her efforts were greatly appreciated by the Board and Chapter President. Heather Stanisci is the epitome of Arcadia’s commitment which is “Pride in Excellence”. These are exciting times for Arcadia. I sincerely believe that this is the best company in the world. Why? An important part of our mission statement is encapsulated in the phrase “Institutional Strength and Individual Attention.” We put forth every last ounce of effort we have and pursue a full commitment to this goal. As important as it is for us to have a mission statement, it is even more important that we show how we do this and lead by example. People may wonder what exactly “Institutional Strength” means for this organization. There are a number of factors that go into “Institutional Strength” for Arcadia. Our strength starts with community, and not just the community in which we work, but also the community inside the workplace. I say this quite often, but I like to think of each individual who works here as a member of a large family. This work environment is a wonderful place where people are happy to see one another on a day-to-day basis, and we are incredibly lucky because of this. There are also other components that go into the strength of this company, such as the outside communities where our offices are located, our technology, and our compliance. Arcadia is vibrant in our local communities, whether it is in Reading, Pennsylvania; San Jose, California; or Columbus, Ohio. It is important to give back to the communities that have been so welcoming to this company, and we do so by such things as sponsoring events and holding food drives. We also do so by entering into long term leases at our locations so we can demonstrate that we want to continue to be a part of the communities where we are located. One of my personal favorite parts of our “Institutional Strength” is the technology that we have implemented. It includes voice analytic software that allows not only our representatives to see what the tone of the customer’s voice means, but also notifies managers if there are any potential problems on calls, so that they can be addressed immediately. Arcadia also has a state-of-the-art phone system, which allows for a steady flow of contacts with customers. With these new technologies come excellent compliance ratings. Ours is a very compliance-focused world, and it always has been, but today we have these new technologies that make it even easier to comply with the law. Thanks to these technologies we have earned special certifications for compliance, security, and accounting technologies.